Powder coating ovens provided by Armature Coil Equipment (ACE) are designed to meet the demands of industrial coating processes. They can be used to cure powder paints onto different types of metal substrates. The oven has a uniform distribution system. This ensures that the curing takes place evenly across the metal substrate surface. The oven also maintains set temperatures, which the user can input. This ensures that the curing process is consistent, and of the highest quality. The oven comprises digital controls. This allows the user to maintain a proportional amount of heat during the curing process. The controls also provide ease of operation. The walls and roof of the oven are constructed out of galvanized steel. This feature adds to the oven’s performance, as well as its long service life. 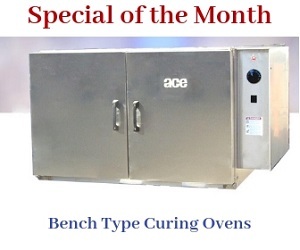 High quality burners are used in the oven, ensuring that curing is performed quickly and efficiently. The oven provides ease in terms of installation and maintenance. During the curing process, the oven elevates the temperatures of both the parts and the powder coat. This ensures uniform coating over the part. The temperature elevation also helps to remove moisture or water on the part. The user can decide on the set temperature points to start the oven. The oven quickly and efficiently cure the component’s coating. When the powder curing process has been completed, the racks are removed from the oven. The racks have accumulated dust and excess powder coating. To remove these effectively, the racks and hooks are placed in a burn off oven, and they are cleaned of contaminants. It is these various beneficial features and specifications that make ACE’s powder coating ovens a popular solution for clients in the paints, powder paints, and coating industries.